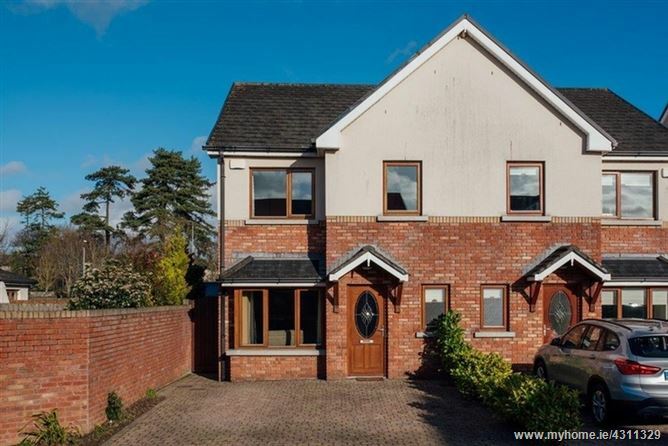 CME are delighted to present this outstanding family home to the market. Situated in the much sought-after private development of Alder Grove, No. 10 is presented in excellent condition throughout with many fine features which are sure to impress. The development of Alder Grove is superbly located within minutes of Naas Town Centre and a host of amenities such as local shops, church, schools, banks, restaurant, gym to name a few. No. 10 is an ideal family home with open plan, modern design affording functional and comfortable living accommodation. Viewing of this property is highly recommended through sole selling agents CME Estate Agents. (master en suite), family bathroom. Laminate walnut flooring, under stairs storage, alarm panel. Laminate wood flooring, gas fire with granite surround, double doors to kitchen/ dining area. Extensive range of oak shaker style kitchen units, with tiled splashback, integrated electric oven, hob, extractor fan, fridge freezer, dishwasher. Patio doors to rear garden. Fitted wardrobes, quality carpet flooring. Tiled floor, WC, WHB, triton electric shower, chrome heated towel rail. WC, WHB, Jacuzzi bath, Triton electric shower, chrome heated towel rail, recessed lighting. Latted timber shelving, hot water tank. Low maintenance south facing rear garden with garden shed. Presented in turn key condition throughout.